An interesting historical document. 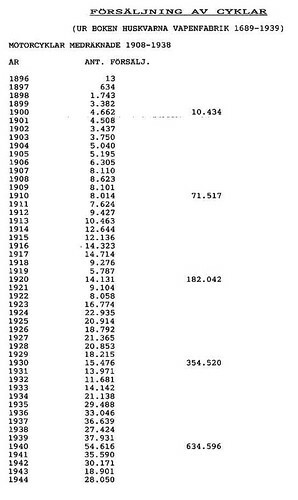 The number of bicycle sold by Husqvarna Weapons Factory from 1896-1944. Funny... a weapon manufacturer selling bicycles. But Husqvarna was founded in 1689 and focused on weapons from the start. Over the course of a few centuries they branched out to produce bicycles, but also sewing machines, kitchen equipment, motorcycles and chainsaws. Interestingly, sales peaked during both world wars.